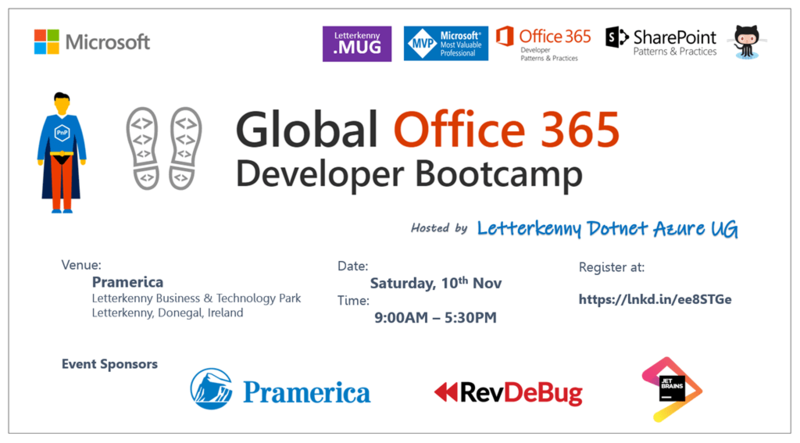 We have got the opportunity to host Global Office 365 Developer Bootcamp in Letterkenny as part of Letterkenny DotNet Azure User Group (LK-MUG). Global Office 365 Developer Bootcamp – Overview? Following the success of last year, Global Office 365 Developer Bootcamp now becomes an annual event. It is a free, one-day, hands-on training event led by Microsoft MVPs with support from Microsoft and local community leaders. Developers worldwide are invited to attend the bootcamp to learn the latest on Office 365 platform including Microsoft Graph, SharePoint Framework, Microsoft Teams, Office Add-ins, Connectors and Actionable Messages and apply what you learn to your future projects. Watch the video to hear from Jeff Teper and Microsoft MVPs on 2018 Global Office 365 Developer Bootcamp. Global Office 365 Developer Bootcamp will take place between October 1 and November 30, 2018. Letterkenny is first venue in Ireland and among many other 59 venues announced so far. Below is the event announcement artwork and agenda. Looking forward to the event. LK-MUG is a Microsoft recognized user community established in Letterkenny, Donegal, Ireland under the full name “Letterkenny DotNet Azure User Group”. We are currently being operated with support of .NET foundation and Microsoft. This community is for everyone interested in Microsoft .NET, Office-365, SharePoint, Azure cloud platform and other Microsoft Open Source initiatives. We are committed to helping you learn and share things about .Net, Office-365, SharePoint and Azure Cloud. Our community brings all students, enthusiasts, experts and professionals working in and around Donegal county in Ireland. Time to time we will be seeing events organized by Microsoft and MVPs to provide best-in-class learning experience for Microsoft Technology enthusiasts.